Abu Garcia's Black Max Series Baitcast Reels offer the type of dependable performance and toughness that one would normally expect to only find in a reel costing two to three times more. Whipping up on the big boys is what these Black Max Series Baitcast Reels are all about, and Abu Garcia didn't cut any corners with these Swedish engineered Black Max low-profile reels. Designed with four ball bearings plus one instant anti-reverse roller bearing, MagTrax brake system, Duragear brass gears, cam lock, ADS (anti-distortion) waffle spool, 6.2:1 high-speed retrieve and a powerful disc drag system. Put your trust in the lightweight Black Max Series Baitcast Reels and you won’t be disappointed or overmatched! "I have recently purchased this reel after researching lots of reels and choosing which one to buy. After receiving this reel i am very pleased and happy with its performance so far. It cast a mile and is very smooth. The drag performs awesome and it is easy to use. Overall this is a great buy for the money." "I believe this product goes along the lines of "You get what you pay for". Yes there are better baitcasters out there and you pay for it. For $50 bucks this is a decent reel I think. It cast smooth and is quiet when reeling in your line. Have used it on about a dozen fishing trips and no troubles to report." "THIS REEL IS AN ABSOLUTE BEAUTY. ITS BY FAR THE SMOOTHEST REEL I HAVE EVER OWNED. YOU CANT GO WRONG WITH THE PRICE. 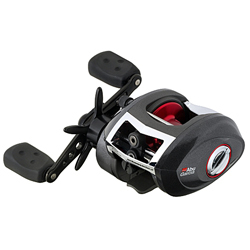 AWESOME REEL WITH A TON OF CRANKIN POWER!" "This is definitely my main reel. It has great braking systems and a nice sleek look. The drag system works perfectly and it feels great in the hand. I would definitely recommend this to anyone."